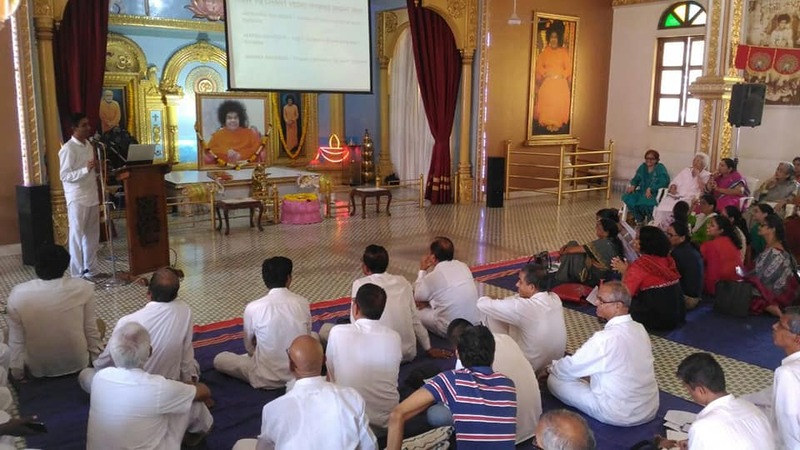 On the occasion of the 45th Anniversary of “Dharmakshetra” at the Spiritual Abod...e of Bhagawan Sri Sathya Sai Baba In Mumbai on Sunday 24th April, 2018, Param Pujya Bhaishri Rameshbhai Oza, a Spiritual Guide And Mentor delivered His Discourse to the vast gathering of devotees assembled here. One fine afternoon, as I was heading towards my warehouse in my AC car, stopped at the red signal. Standing on my right, in the scorching heat, was a delivery man of gas cylinder on his tricycle, sweating it out tremendously & with no cap or handkerchief at all, given no option that he has to work hard for his daily bread & butter. Stunningly, I thought I wouldn’t be able to lift 1 cylinder & this guy he is moving ahead with 12/14 gas cylinders. Quite pained by his hardship, promptly got a thought to provide a cap to such labour which will get him some relief from the heat. 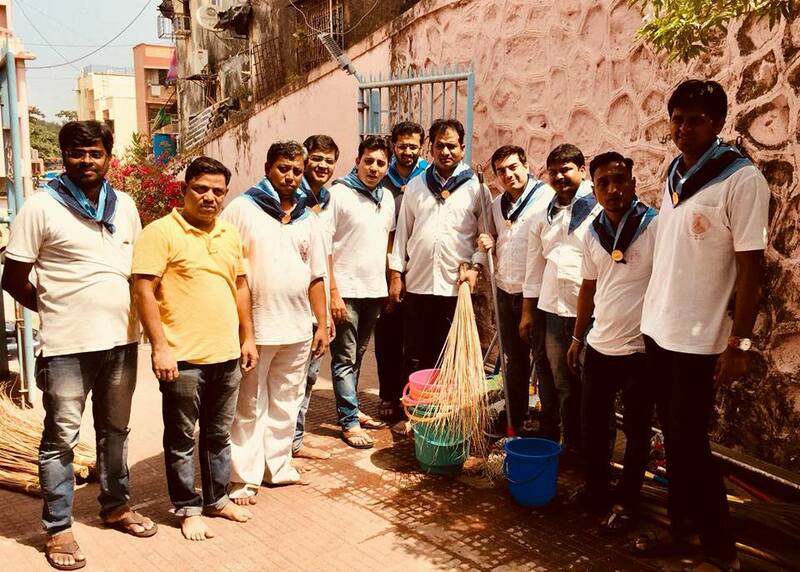 Promptly this suggestion was placed to the Bandra Sai Youth Team & the proposal was whole heartedly accepted with suggestions to also provide the caps to other labour class working relentlessly in the heat to earn for their living. The activity which we never thought about proved to be tremendous, heartening to receive some appreciative gestures & also impressive comments by such deserving people. The 4th Regional Veda Conference ( Maharashtra and Goa) was held today at Dharmakshetra and was conducted by Bro. Dr. Siddharth Rangan, District Veda coordinator and currently working as Assistant Professor in Department of Physics, University of Mumbai and by Bro. Monish Manohar Pahilwani, Asst. Director, Standard Chartered Bank and currently District Veda coordinator for Thane district. About 30 gents and 34 ladies attended. Padma Shri Dr. V. Mohan as our honoured Guest Speaker shared some of the medical miracles and his personal experiences and lessons from his journey with Divinity in human form. 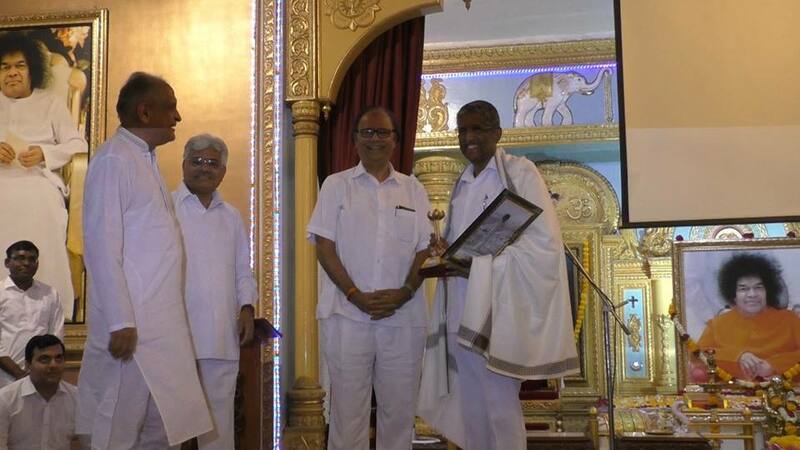 Dr. V. Mohan ascribes all his success to Bhagawan's Grace and Blessings and considers his position given by Bhagawan as Convenor of the Board of Trustees of Sri Sathya Sai Trust, Tamil Nadu and his elevation as a Member of the Board of Trustees of the Sri Sathya Sai Central Trust, Prasanthi Nilayam as the greatest honours he has ever received. 1) Dahisar Railway Station East and West. 2) Borivali Railway Station East and West. 3) Kandivali Railway Station East and West. 4)Sai Baba Mandir Borivali West crossing. 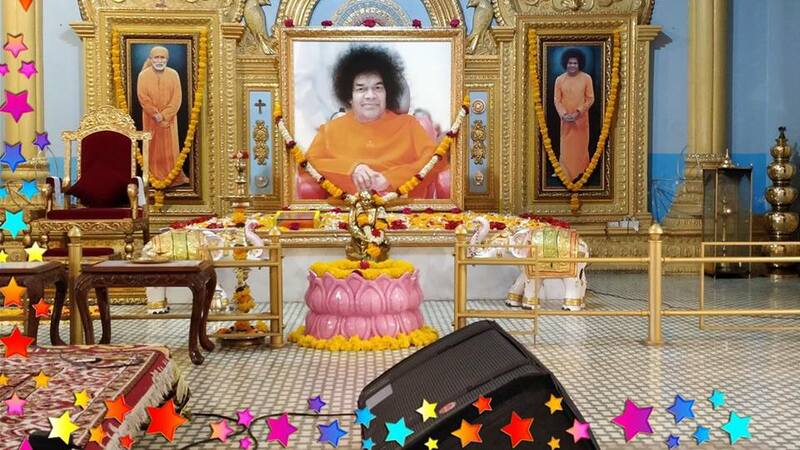 Holy Aaradhana Diwas of Bhagwan Sri Sathya Sai Baba with Satsang of Poojya Bhaishree Ramesh Bhai Oza will be held at Dharmakshetra tommorow 24th April 2018 from 5 pm onwards. Brother Sai Kaustuv stole the show by speaking motivational words & singing his love for Bhagwan. 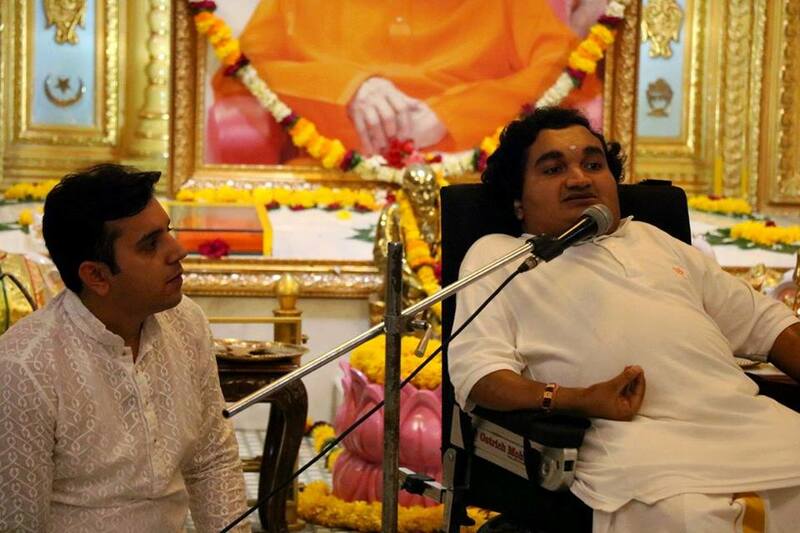 Brother Sai Kaustuv offered some #motivational words & one of his composition at Bhagawan's lotus feet which was followed by Felicitation Ceremony along with his parents & younger brother Kushal. A huge crowd of around 400 people including the #Balvikas children & parents along with Gurus & Devotees made a wonderful offering at the Divine Abode “DHARMAKHETRA”. Message from the All India President Sri Nimish Pandya. We are now reaching to the culmination of the month long Sadhana of “ Giving and Forgiving “. We are grateful to Bhagavan for this opportunity. If you visit our website and read the reactions of people, you will feel happy. Please celebrate this at all Bhajan centres tommorow and play the song I have sent to all . 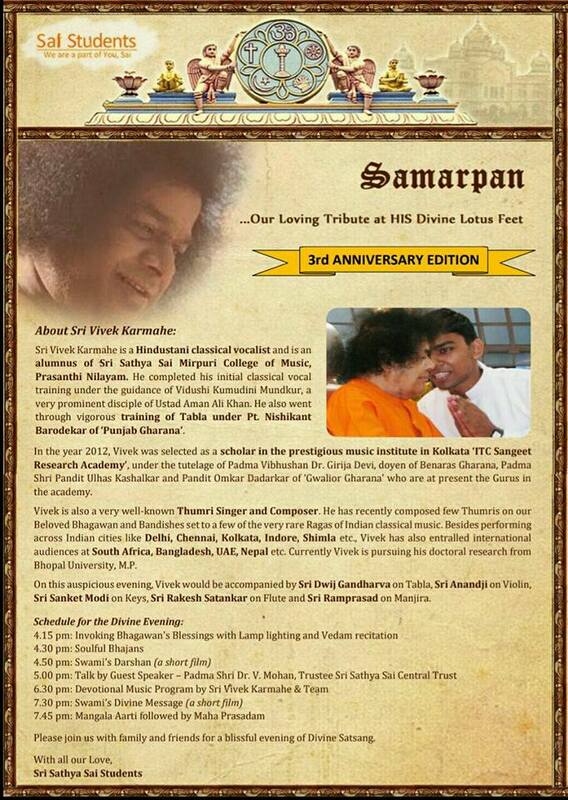 Please share the song with all devotees in your state and help them enjoy the same . 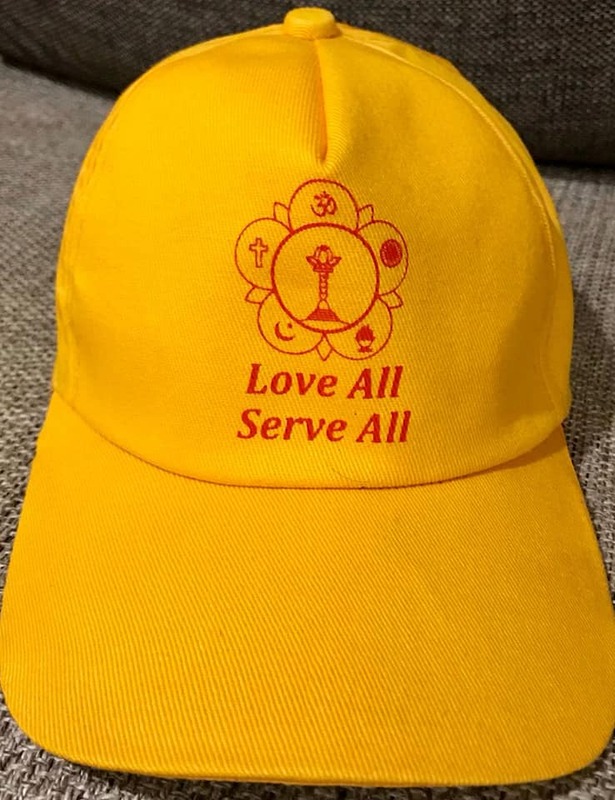 I am very happy to let you know that the efforts put in by most of you to promote this sadhana has had a great response from people who have understood and practiced this sadhana. In this context, our brothers from *West Bengal have composed a beautiful theme song* on this Month Long Sadhana. I am praying to Swami that we can play this at Prashanthi Nilayam on the Aradhana Divas. 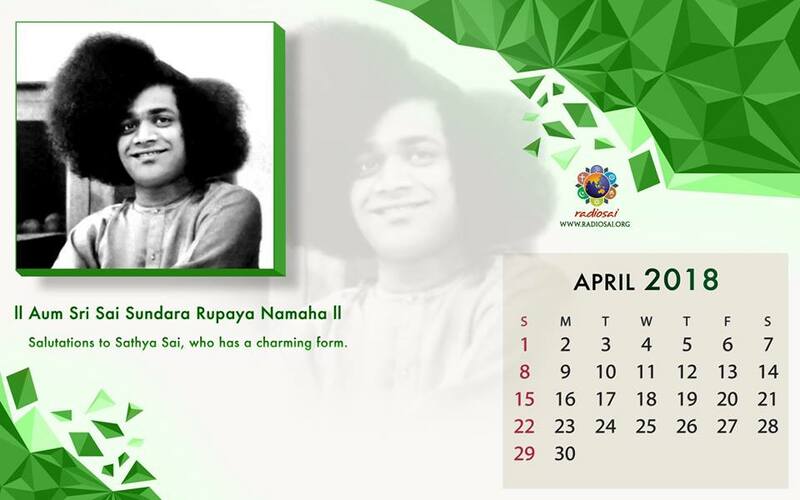 However, I am sharing the song and its lyrics for you to share with all devotees and probably *play this at all centres during this Aradhana Divas* as a culmination of the month long sadhana. I pray that we make good use of this for the benefit of all mankind.Please share this withh all. We take this opportunity of adoring our most Adored Bhagavan with this unusual offering in form of the resolve of 'Giving and Forgiving'. There is no charity more difficult than granting forgiveness. Nor is there any gift that is superior to forgiveness. Forgiveness is the paramount expression of Love. Let us resolve to keep anger under strict restraint and cultivate Love towards all. Let there be no feeling of hatred towards anyone and let prosperity of all be our earnest wish. There are plenty of needy people in this world. But being a servant and to be able to serve is not easy! Thus, consider every opportunity to serve as Sai's Grace. As are our words, so should be our deeds. Love and sacrifice should be our way of life. Let our hearts always be full of goodness towards others. Let our every deed be an act of worship to Sai. Vivek Karmahe at his awesome best. In the year 2012, Vivek was selected as a scholar in the prestigious music institute in Kolkata ITC Sangeet Research Academy, under the tutelage of Padma Vibhushan Dr. Girija Devi, doyen of Benaras Gharana, Padma Shri Pandit Ulhas Kashalkar and Pandit Omkar Dadarkar of Gwalior Gharana' who are at present the Gurus in the academy. Vivek is also a very well-known Thumri Singer and Composer. He has recently composed few Thumris on our Beloved Bhagawan and Bandishes set to a few of the very rare Ragas of Indian classical music. Besides performing across Indian cities like Delhi, Chennai, , Shimla etc, Vivek has also entralled international audiences at South Africa, Bangladesh, UAE, Nepal etc. Currently Vivek is pursuing his doctoral research from Bhopal University, M.P. 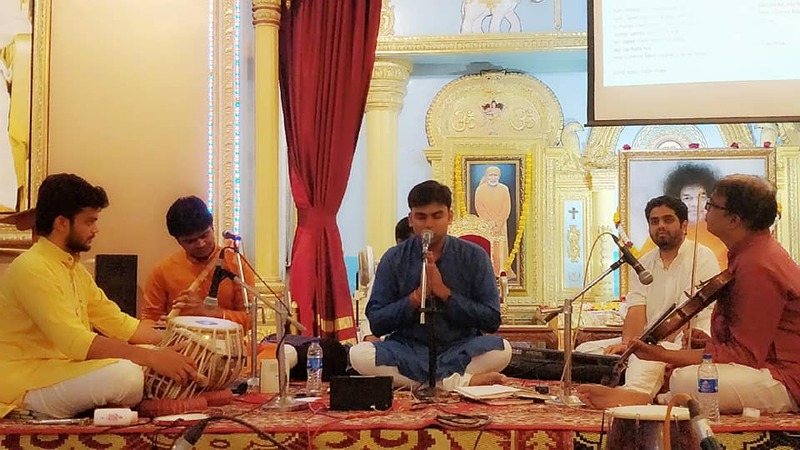 On this auspicious evening today, he was accompanied by Sri Dwij Gandharva on Tabla, Sri Anandji on Violin, Sri Sanket Modi on Keys, Sri Rakesh Satankar on Flute and Sri Ramprasad on Manjira. 5.15 a.m. Omkar, Suprabhatam followed by Nagarsankirtan. As we approach the *3rd Anniversary* celebrations of *SAMARPAN - MUMBAI*, to be celebrated on 22nd April, here is a snippet by *Shri Arjun Rao* on his experiences with Samarpan. Shri Arjun is an active member of *Sathyam Bhajan Group* and *one of the chosen one by Swami to enjoy Samarpan sessions on a regular basis*. He is part of Andheri samithi. 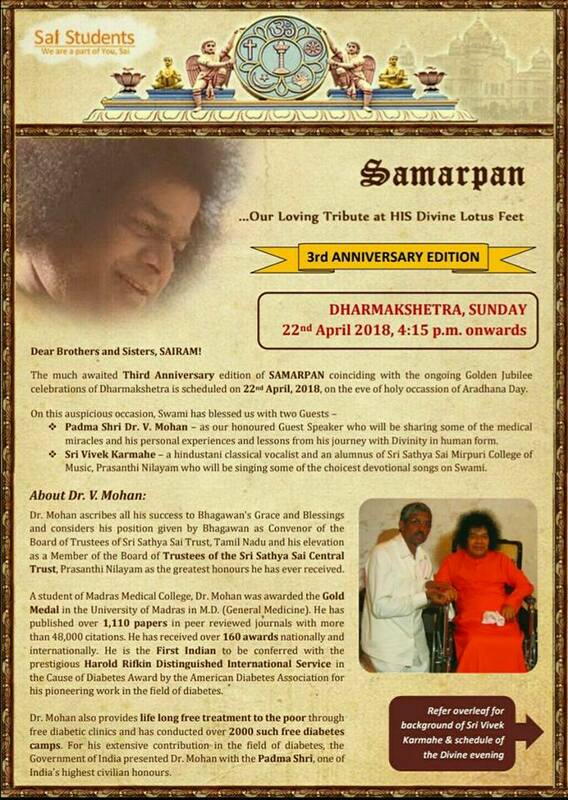 As we approach the ​3rd Anniversary​ celebrations of ​SAMARPAN - MUMBAI​, to be celebrated on 22nd April, here is a snippet by ​Shri V. Jayasankar​ on his experiences with Samarpan. Shri Jayashankar is an Investment Banker by profession and is a regular attendee of Samarpan talks in Mumbai. The Bal Vikas children of Bandra Khar Santacruz samithi presented a beautiful cultural program wherein around 75 children participated & enacted to give a wonderful performance in a 2 hour program. Later at 6 pm, the curtains rolled up at Shanti Deep to watch the most eagerly awaited program. 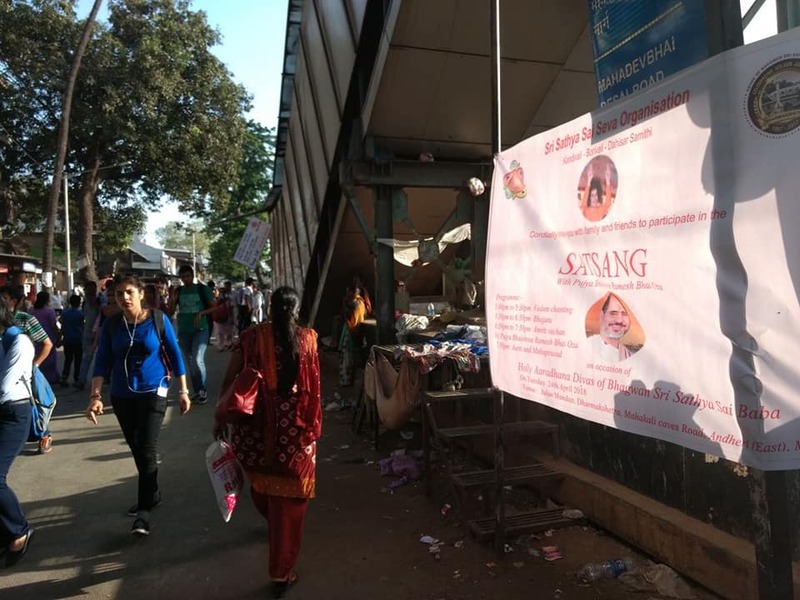 By Swami's grace Dharmakshetra cleaning programme by Mumbai Sai Youth on 16th April 2018 went very well. 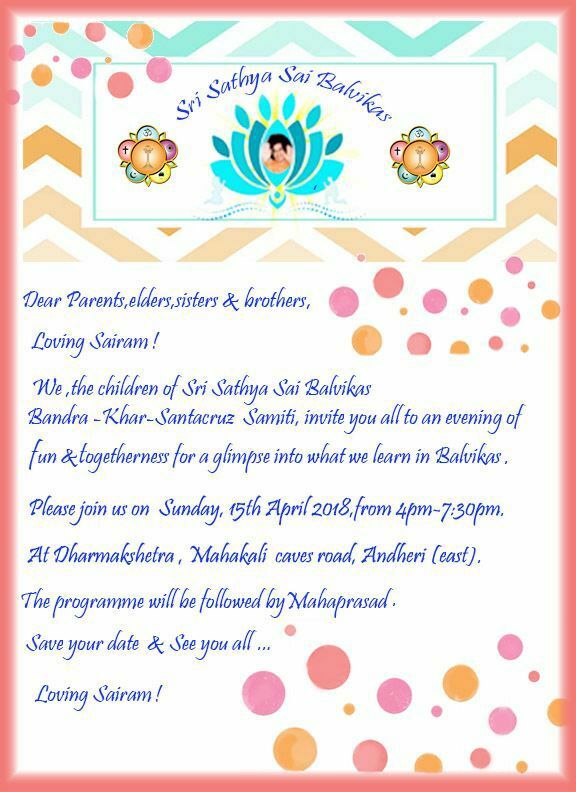 Sri Sathya Sai Balvikas Gratitude Day Programme at Dharmakshetra on Saturday 14th April 2018. Shri. 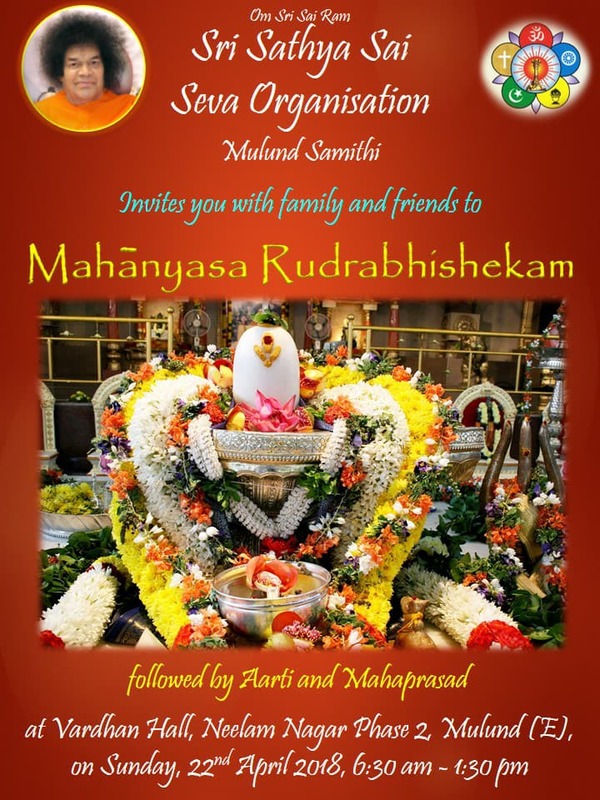 Ramesh Sawant, State President of Maharashtra and Goa, message regarding 22nd April 2018 " Rudra Parayan Aradhana"
A Sadhana camp on the Nine point Code of Conduct was held for the office bearers of SSSSO of the district and samithis of Mumbai,Vashi,Palghar and Thane at Shantideep, Dharmakshetra on 1st April 2018. 2) *Sri Vivek Karmahe*, a Hindustani Classical Vocalist and an alumnus of Sri Sathya Sai Mirpuri College of Music, Prasanthi Nilayam. He will be enthralling us with devotional songs. All are cordially invited with family and friends for this blessed and blissful Satsang in the Divine Presence at Dharmakshetra, whose Golden Jubilee we are currently celebrating. Eager to receive you all. 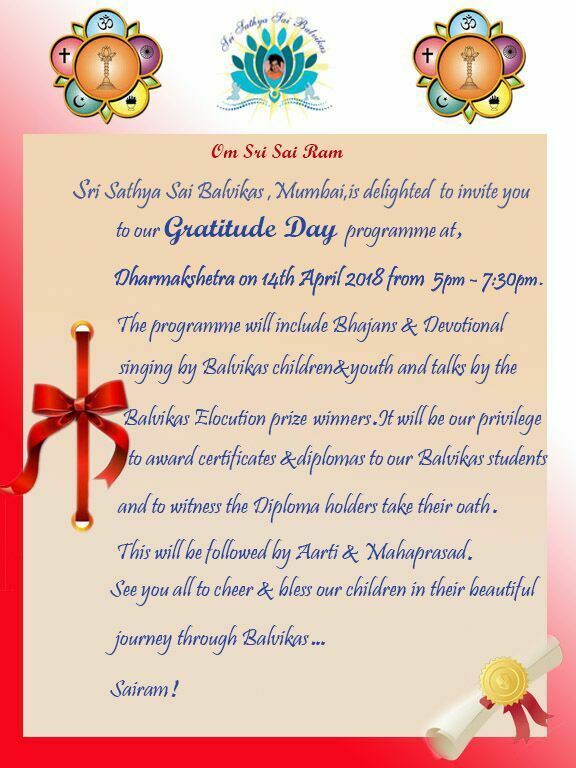 Sri Sathya Sai Balvikas - Gratitude Day Programme at Dharmakshetra on Saturday 14th April 2018 from 5 pm onwards.